SEOUL, Aug. 15 (Xinhua) -- South Korean President Moon Jae-in said Wednesday his country will deepen trust with the Democratic People's Republic of Korea (DPRK) in the upcoming summit with top DPRK leader Kim Jong Un. Moon made the remarks during a ceremony to mark the 73rd anniversary of the Korean Peninsula's liberation from the 1910-45 Japanese colonization, according to the presidential Blue House. After the high-level talks earlier this week, the two Koreas agreed to hold the third Moon-Kim summit in Pyongyang before the end of September. Moon and Kim met in April and May at the border village of Panmunjom, promising to meet in Pyongyang this fall. Moon said he will take a dauntless step, through his summit with the DPRK leader, toward the complete denuclearization of the Korean Peninsula as well as the war-ending declaration and peace treaty. The peninsula remains in a technical state of war as the 1950-53 Korean War ended with an armistice, not a peace treaty. Agreements can be sincerely implemented only after deep-rooted distrust is eliminated between Seoul and Pyongyang and between Pyongyang and Washington, Moon said. Moon vowed to build deeper trust relations with the DPRK, while making best efforts to facilitate a denuclearization dialogue between Pyongyang and Washington. The South Korean leader stressed that improved inter-Korean ties are not a byproduct of the enhanced DPRK-U.S. relations, but an impetus for the peninsula's denuclearization, saying nuclear threats were eased when inter-Korean relations were good in the past. 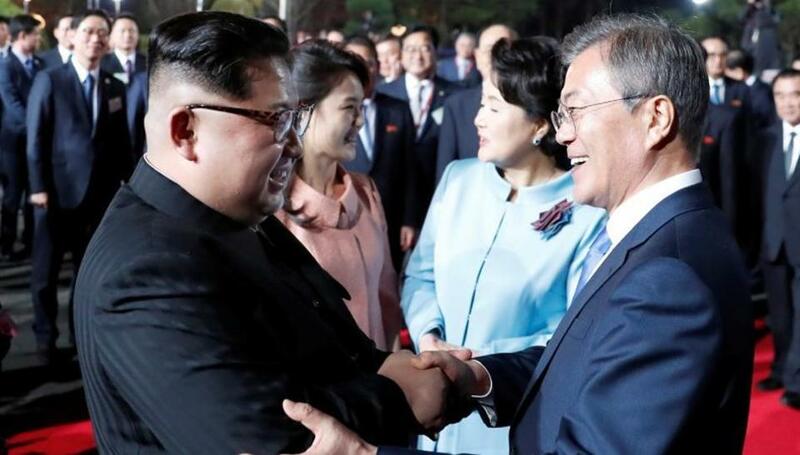 Moon and Kim held their first summit on April 27 in Panmunjom, agreeing to the complete denuclearization. It was followed by the inter-Korean summit on May 26, eventually leading to the historic summit between the DPRK leader and U.S. President Donald Trump in Singapore on June 12.